We couldn’t bust out of Wyoming fast enough. Within a quick drive, we were saved by glorious Ft. Collins. We started roaming the adorable little college town’s downtown area and stopped into the Bean Cycle for some morning brew. Here’s something we didn’t expect of the place. It’s huge. It’s absolutely deceptively ginormous. It just goes on and on and there’s even a little upstairs with a bookstore? The counter is huge, and the menus behind the counter are huge. 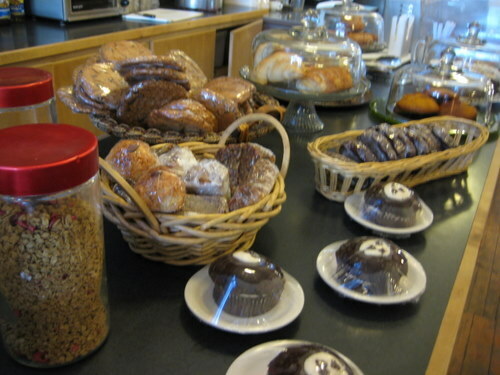 They have a huge variety of organic and vegan baked goods. 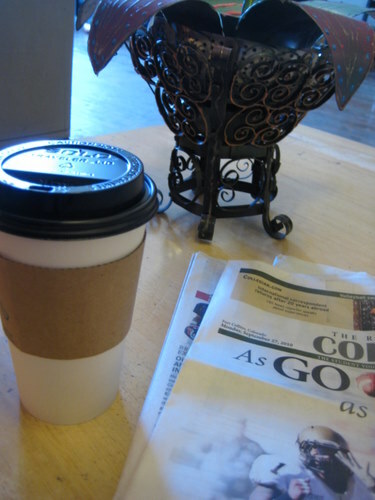 In fact, one thing I noticed, is that most of the coffee shops in Colorado specifically seem to carry vegan baked goods. There are some sofas, a piano, some counter space, and tons of tables for you to get comfortable. 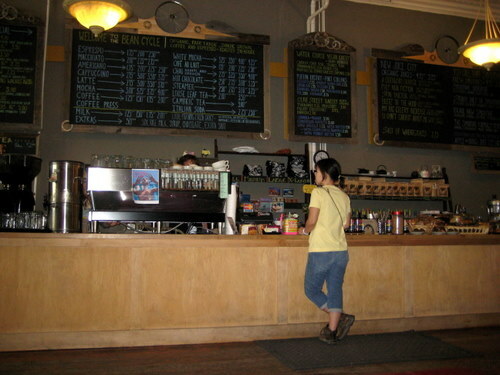 It is family operated shop, and all the coffees are organic, fair trade, and roasted in-house. In addition to your standard coffee options, they have a number of specialized drinks. I got the Ella Vanilla, made with honey, vanilla, steamed milk, and espresso. It was ella good! Strong and delicious. S got the Mexican Mocha, made with cinnamon stick, orange, ghirardelli chocolate, and espresso. She enjoyed hers immensely. They’re not exactly speedy here. It takes awhile to get your order, but that’s ok. You can just hang out and relax.